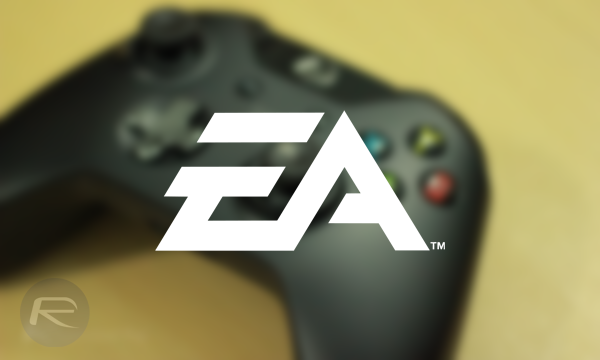 When EA announced its Access service a few weeks ago, everyone stood up and took notice. While the folks at Sony apparently didn’t think it was a big deal, those on the limited beta felt otherwise. Now, as of today, that beta has given way to a full service that is available to anyone in the United States who owns an Xbox One that’s connected to the Internet. Available for either $4.99 a month or $29.99 a year, EA Access gives gamers the ability to download and play a collection of Xbox One games that currently looks a little thin on the ground but is said to be expanding soon enough. 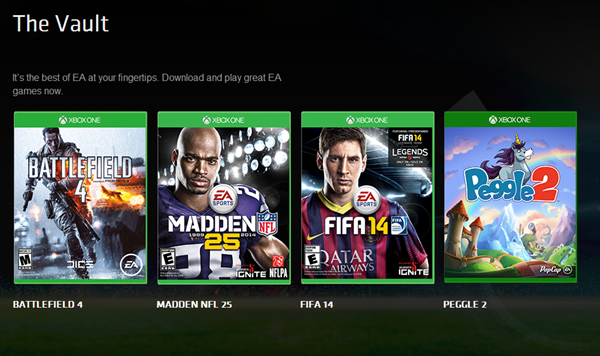 The games available to choose from what EA is calling The Vault are Battlefield 4, Peggle 2, FIFA 14, and Madden NFL 25 so if you’re a fan of first-person shooters or playing sports, then you’re pretty much golden. If you’re not though, it might be an idea to wait until EA announces its next batch of Access titles. To that end, EA is pushing the fact that subscribers will be able to play games before non-subscribers, saying that they “also have the opportunity to try new EA games five days before the release date.” Five days may not seem like a long time, but if you’re killing time waiting for the next big FIFA or Madden release, then it can give gamers a chance to hone their skills before taking on the ‘n00bs’ online. EA has not yet announced plans to bring Access to customers outside the United States and will instead hopefully focus its energies on increasing the number of titles in The Vault. Right now we’re not sure whether we’d recommend subscribing unless you’re a fan of the games already included, but we’re just pleased to see such a service being offered at all. It was just last week when we got wind of the fact that EA has added a bunch of awesome new features to its Access service. And given the fact that EA is indeed working day and night on improving on service before it’s ready for a wider rollout, it speaks for itself that greater titles would be put on offer along with some other cool stuff. 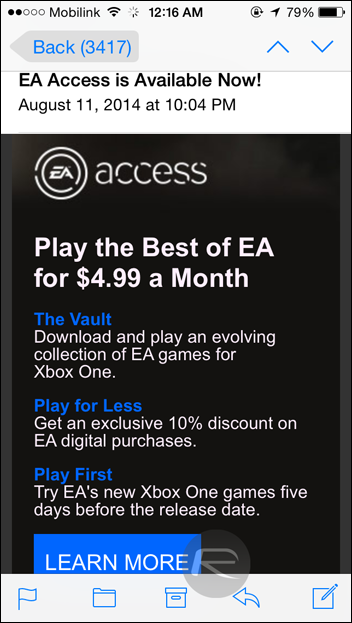 If you’re in for some gaming, then point your browser to ea.com/eaaccess and get started! So I’m confused right now, does this mean you can permanently keep the game? Or is it a rent kinda thing? Can confirm it’s available in Australia. Just started downloading battlefield and madden! I’m sure it’s like every other cloud based platform, where if you don’t continue the service, you can’t play the games anymore (think PSN+). Madden is the only game I play, but being able to play last years sports games for FIFA and NHL would be something I’m interested in. Also catching up on games I may have missed out on, like Battlefield is a selling point. I’ll probably try this out for a month or two once they add more games.